What is your favorite distance and why? The half. It’s a great combination distance and speed, and I can still walk normal the next day! What do you struggle with most in running? Slowing down my recovery and easy mile days. I’m learning that it’s OK to go slow, it helps you really nail those key workouts (Still a work in progress though-lol). Do you rotate shoes and if so what is in your current rotation? Yes!!! I currently have 4. I mainly run in my Adidas Boston’s, but I run a lot of my easy miles in my Solarboost and Tempo’s. I run in my Saucony Kinvara’s for shorter faster running. I keep a mileage log on all of them too! Do you have a mantra that you use when you are racing/training? Your legs are not giving out, your head is giving up, keep going! Do you ever feel unmotivated to train and if so how do you overcome it? Everyone has had those moments especially during marathon training. I snap myself out of it by telling myself how will you feel on that start line if you didn’t prepare 100% in your training. How do you expect to give your best effort if you aren’t prepared? That usually gets me going again. What is the best thing running has given you? All the amazing friendships and people I have met along the way! Especially my hubby! What is your favorite race you have participated in and why? Boston!!! Need I say more?!? Nothing like those crowds. I saw a flyer for Glass City Marathon back in 2011 at my gym at the time and thought it would be an awesome experience and challenge to run the half. After that I was hooked. What is your favorite running workout? I LOVE a good speed session. There’s something freeing about your lungs and legs feeling like they are on fire. My favorite is 5-6 1200’s. I mix it up with breaking them up into a 800 with a fast 400 finish. How many marathons have you run? Who is your favorite professional runner? Molly Huddle. 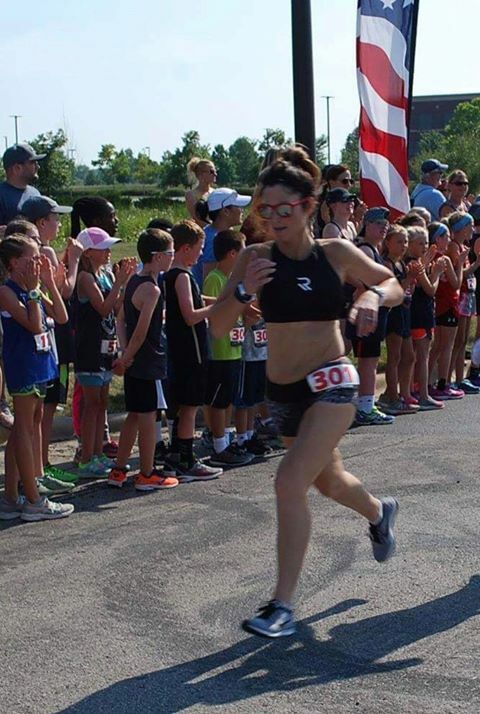 She’s just a beast at anything from a 5K-to Marathon. So much talent! And she always has the best nail art! What are the craziest race conditions you have had to endure? Dave’s 10 miler 2015. It’s a January race out in BFE Delta,Ohio. Blizzard like conditions, I think it was around 20 degrees with about 30mph winds. So cold! At one point, there was a complete white out. Do you have a goal race you haven’t done yet and why do you want to do it? Yes!!!! Big Sur! Those views from Highway 1 are just absolutely breathtaking. Do you listen to music while you run and if so, what music gets you pumped up for a race? No music for this girl!